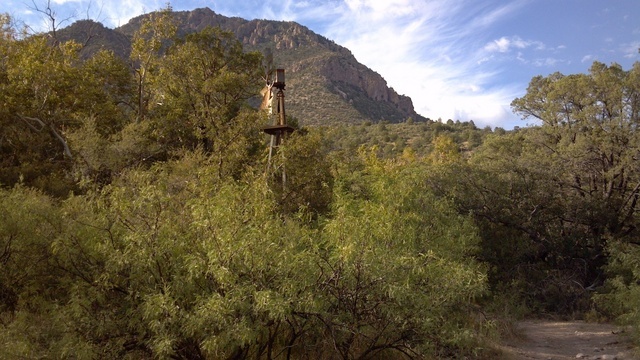 The Turkey Creek hot springs are a nice little set of hot springs in the Gila Wilderness, but finding them is a bit challenging. If, like me, you thought the description in the guidebooks would get you there, this entry is for you. Start with the guidebook, but hopefully this will fill in a few of the gaps and correct the mistakes. From Silver City, take NM 180 west for about 22 miles. Turn right onto NM 211 and go about 4 miles to Gila, NM. Stay to the right to continue on NM 153 when the road branches. After about another 4 miles, the pavement ends and you’ll continue on a dirt road. Continue on this road for another 9.5 miles. Eventually the road dead ends at a small parking area. The trail starts right at the parking area. At first, the trail is wide and well-maintained. You’ll see tire tracks from vehicles that have followed the same path. 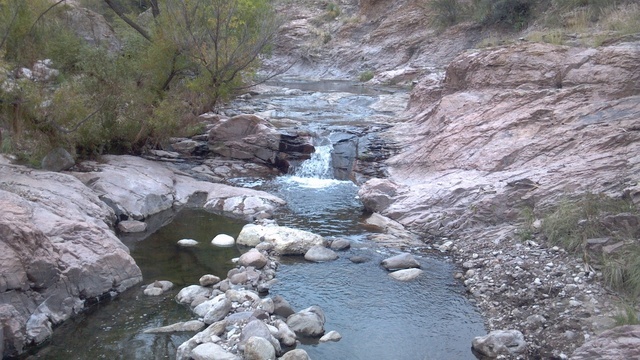 You’ll be crossing the Gila river three times within the first mile. Bring sandals or other waterproof shoes for crossing the river. 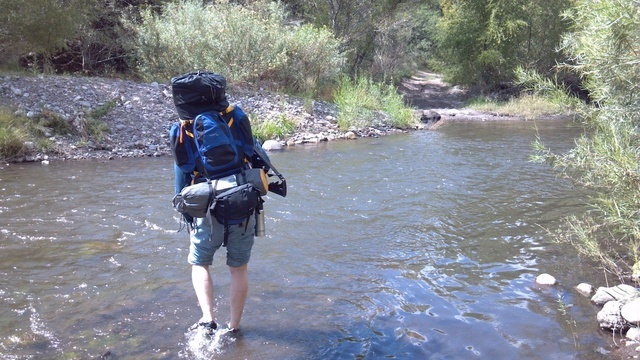 Since the trail is nice, it’s probably easiest to just keep your sandals on until you pass the third crossing. There are trails that run parallel to the river, but just ignore these. Whenever the main trail reaches the river, that means you’re supposed to cross. The path often resumes offset by 20 or 30 feet, so keep an eye out before you start crossing. After the third crossing, you can put your boots back on, since you won’t be getting your feet wet any more. Continue up the trail; you’ll pass some abandoned shacks and a rusty windmill within a few minutes. When the trail reaches Turkey Creek, continue to follow it north along the creek. You’ll cross over the creek several times, but you should be able to hop across. After another 1.5 miles, you’ll come to an area that looks like it should be perfect for camping. It is. 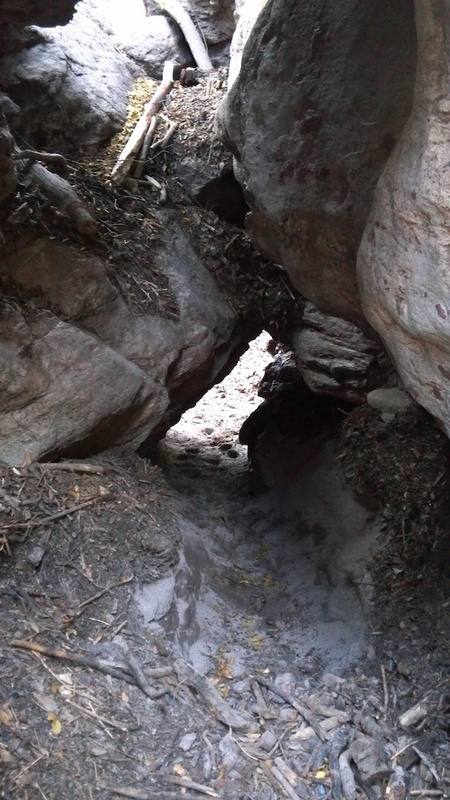 The trail gets much tougher beyond here, and the camp sites aren’t nearly as good. If you’re staying overnight, you should stop and make camp here. Continuing beyond the camping area, keep a close eye out to the right. You’ll come to a fork in the trail marked only by a small pile of rocks. 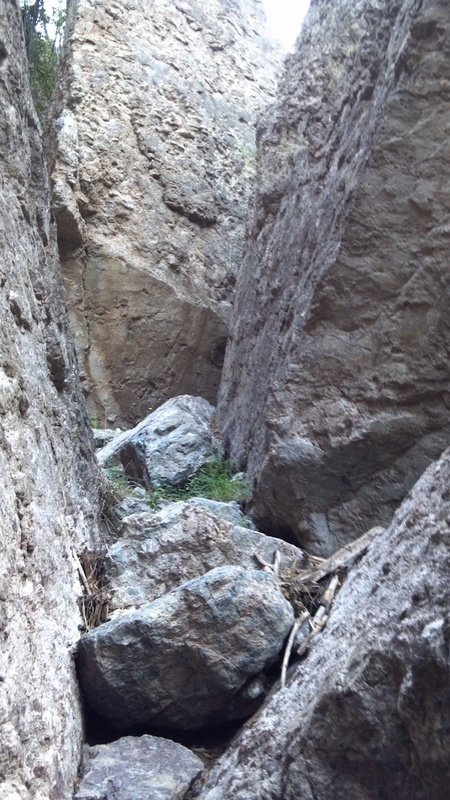 The trail that goes off to the left almost immediately starts climbing up the side of Skeleton Canyon, which is not the way you want to go. The tiny, faint path heading off to the right is the branch you want. Follow this path for a short distance, and then you’ll hit the creek again. Of course, that assumes you followed the earlier suggestion to make camp and leave your pack behind. If you’ve stubbornly carried your pack this far, you get to scale the cliff or climb up the small waterfall instead; you won’t easily get a backpack through those rocks. If you like your hot springs warmer than a baby’s bathtub, continue up to the top level. People have built a nice set of pools for soaking along here. 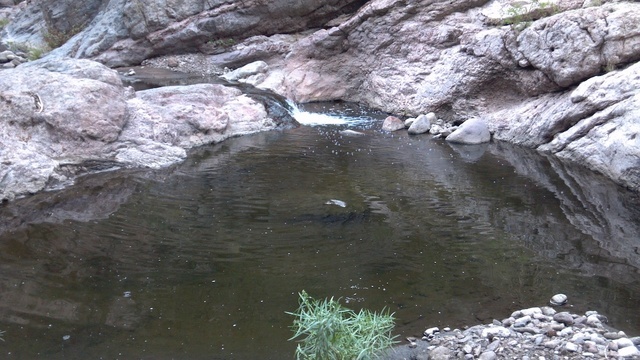 The pool on the right where the waterfall comes in is fairly cool, and the pools on the left range from hot to scalding. Clothing is optional, but highly recommended (unless you want the algae stains on your skin instead of your swimsuit). There is a dangerous amoeba called naegleria fowleria that may be present in the hot springs. The best defense is to avoid submerging your head. If you’re looking for a well-developed, civilized set of hot springs, Turkey Creek is not for you. If you want a moderately rugged hike through a beautiful area and you don’t mind soaking in the same pool as a bunch of disgusting, slimy green and black algae, these springs are worth the effort. We found that the trip in took about 5 hours because of all the false trails and river crossings. Once we knew where we were going, the return trip only took 3 hours. If you have comments or questions about this post, please send an email. Be sure to leave the subject line alone, or your email is likely to be caught by spam filters.